This weeks Featured Blog Friday comes from our Head of Development, Sigrún B. Gunnhildardóttir. If you have any questions or comments regarding this blog, feel free to leave a comment below or send us a tweet @AGRDynamics. The first version of the AGR Sales Planner was introduced in 2009, and provided a way for companies to connect the people responsible for sales and marketing with the replenishment process. The software allowed for planning on high levels (product groups, total time period of the year, etc.) and distributed down to the lowest level (item number, days, etc.) as well as planning on different dimensions, like customers, locations, product groups, etc. This original planner was successful and implemented with multiple different companies playing a vital role in the Sales & Operations Planning process for many of our bigger clients. It served its purpose well and did what it needed to do. As time went on, we learned a lot, and it soon became apparent that the data structure of the software was very rigid and complex. We were in a sandbox environment, as the datasets behind each plan were isolated, which made it difficult to pull in additional information or compare against actual performance. Furthermore, every value needed to be stored on the lowest data level. While this was good to connect to replenishment, it made it very difficult to create new uses for the planner and expand its scope. The bottom line: we wanted more. We wanted to be able to capture the whole planning process. We first tried to continue on with the planner as it was. We updated it to our new web-based platform with some added functionalities, but we were still hitting the same brick walls. We had a big decision ahead of us: Do we keep going with the software as is and try and make it work with new processes, or should we make a bold decision to start over on the software from scratch? While the latter option sounded absurd, as we had already invested a lot of time into the then current planner, when we looked at where we wanted to go, the choice was easy. Create a dynamic, flexible and configurable planning engine. The engine should solve the needs of our current customers but at the same time, have the ability to be the base for different planning processes. In other words, the task we were taking on was to build the engine, not the product; a powerful engine that could be utilized in numerous different ways to fit a number of purposes to suit the needs of different customers. It needed to offer the ability to view and amend data from many different data sources and an extensive ability to display the same data in different ways. It had to have dynamic filtering options, graphical representation of data, and of course be user friendly and intuitively designed. If we would have an engine like this we could plan anything! 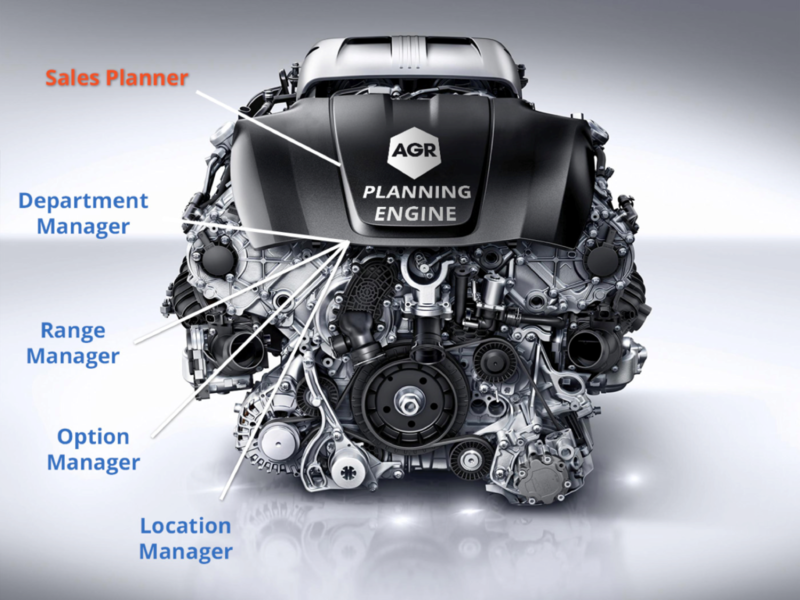 This new planning engine idea is similar to that of a car engine. You can either fit it into a normal car that would be excellent for getting to work and other everyday tasks. Or you could use it for a customized sportscar, ideal for the terrain you’ll be racing in. Whatever the purpose, we could fit it in. While building the engine, we also started to create the sales planner, which would be a module on top of it, and the part of our goal “to serve current customers needs” was always in the back of our minds. This time around, we developed an even better solution, with the key to the planning engine being that it is highly configurable, dynamic and simple to set up. With this level of flexibility the possibilities are endless, and currently we are working on four different modules for merchandising management. But as you can see, there is room for even more. For example, we at AGR Dynamics are not in retail or wholesale, but we need to do our own planning, and we use our engine to create our revenue plans and manage our resources. We thought that if we could not use our software ourselves, we couldn’t expect our customers to either. This is a known method in software development, where we are not only testing the calculations and the features but getting direct feedback on usability and design very early on in the process. Below is a picture of a basic sales plan. The Total Demand is based on the statistical forecast, with promotions on top of it. You can start working with the numbers within the sales plan, and if you choose to add a promotion, the system will automatically calculate the data as per the new promotion and refresh all the data to reflect this change, as well as distribute it to all items below. The sales planner is designed in a way that the user can see different views and templates that are included in the software, making the sales planner very user friendly. It also gives each user the ability to easily customize how they view their data. By using the grid settings, I’m now viewing the same plan as above but now I have a total overview of Product Groups by Vendors. If I choose to make changes to my plans at this level, my inputs would be automatically spread over the previously defined time period. 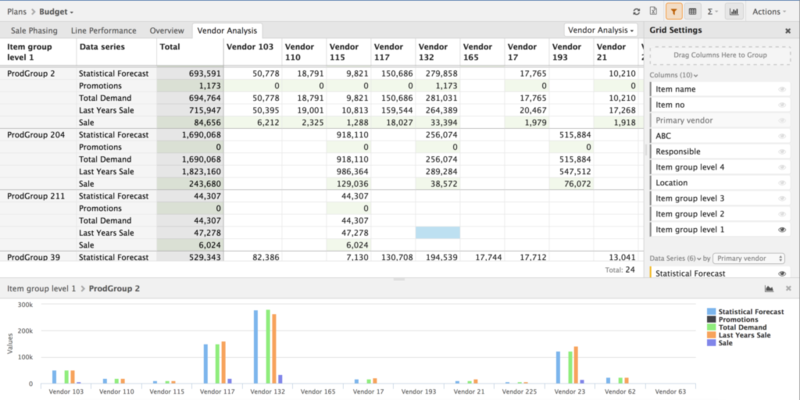 The grid setting also makes it easy to reorder columns or add different data sources into the sales planner, to name a few. We have worked very hard on this engine and are excited to bring you a brand new version of the sales planner, and making it as user friendly as possible. We hope you find it as useful as we do and look forward to implementing it beside our inventory optimizer helping you to further integrate your supply chain management processes.